On this site, there's an awful lot of talk about heavy duty, high quality work boots to help you get your work done, but we know full well that work is not the only place you need some tough, reliable boots. With a pair of Chippewa Men's 27914 Brown Bomber Jacket S ... (see full details) (see specifications) #CHP27914. On this site, there's an awful lot of talk about heavy duty, high quality work boots to help you get your work done, but we know full well that work is not the only place you need some tough, reliable boots. With a pair of Chippewa Men's 27914 Brown Bomber Jacket Slip-On Boots, you can get the same rugged quality out on the open road. Chippewa has been making the highest quality men's boots since 1901, so you can be sure they know a thing or two about making Chippewa boots for many different occasions. 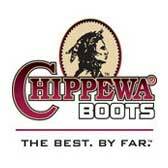 Chippewa keeps the standards high with these USA-made boots. The tan leather uppers are extremely durable and water-resistant, and they have a handsome bomber jacket tone. The Goodyear leather Welt construction makes these brown boots extra strong and long-lasting. Triple-ribbed steel shanks and 4 iron rubber midsoles add extra reinforcement and support for your feet and arches. Non-tarnishable chrome rings serves as excellent hardware on the exteriors. These are just as durable as the American-made footwear itself. The Vibram rubber cork yellow plug outsoles are durable and shock-absorbing. They're also resistant to oil and slips, making it safe for the garage. You won't need to worry about foot discomfort thanks to the leather vamp lining, designed to feel good against your feet and legs. The Texon insoles are breathable, flexible, and durable, which means you'll be comfortable in these abrasion-resistant boots for miles and miles. Some people need a tough work footwear for their jobs, while others need tough work boots for play. If you're in this second group, pick up a pair of American-made Chippewa Men's 27914 Brown 12 Inch Bomber Jacket Slip-On Harness Boots for the most durable and highest quality footwear for the road. I'm pretty picky about foot wear, so keep that in mind. For the price I was expecting a nice comfortable boot, like a good sneaker. This was not the case with these boots. Very stiff and the soles are hard. You need to invest in a pair of really good insole supports to make these wearable throughout the day. They are big and heavy also. I wouldn't recommend these boots to anyone. These boots are made from high quality leather and are comfortable they feature a slighty western look but also sport the harness, vibram makes a fantastic sole and the Chippewa quality is top flight. the duke highly recommends anything from them!! Chippewa Boots: Men's USA-Made 27914 Brown Bomber Jacket 12 Inch Harness Boots is being added to your cart.